The ability to add all registered users to everyone's roster is one of the most requested features for ejabberd. Especially small enterprises are itching to see everybody in everyone's roster. This feature is available since ejabberd 1.0.0. 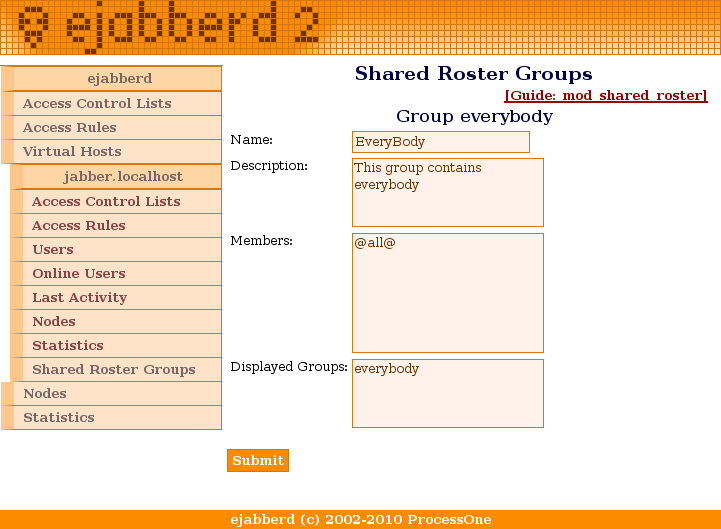 As of version 1.0.0, ejabberd allows the administrator to add all users on a virtual host to a shared roster group. When he creates a shared roster group on a virtual host, and specifies the members, he can put @all@, and ejabberd will add all users on the current virtual host. This feature requires internal authentication. If you use external authentication, LDAP... then adding @all@ to a shared roster group will do nothing. Create a new Shared Roster, with identifier 'everybody'. Click on 'Add new'. When any user logins, he will have a new group in his roster, called EveryBody, and containing all the other users registered on the server. Check in this screenshot how the group must look. Important: note that boy and boby will not see presence from the other people. They will be on the roster, but always offline because the other people don't have boy and boby in their rosters, and don't share presence with them. Create a new Shared Roster, with identifier 'badboys'. Click on 'Add new'. When boy or boby login, he will have as contacts everybody else registered on the server, but they will not have him on their rosters. Important: note that people will see weatherman and governor offline, even if they are logged because weatherman and governor don't have everybody in their rosters, and don't share presence with them. Create a new Shared Roster, with identifier 'publicppl'. Click on 'Add new'. Create a new Shared Roster, with identifier 'spectators'. Click on 'Add new'. When any user logins, he will have the public person on his roster. Create a new Shared Roster, with identifier 'mountain'. Click on 'Add new'. Create a new Shared Roster, with identifier 'earth'. Click on 'Add new'. When users login, they can see Sauron. If Sauron is online, they see him online, and viceversa. Submitted by ashgmas on Thu, 2016-02-11 13:34. How do I do this when I'm using external auth? Submitted by badlop on Mon, 2016-02-15 14:18. The external auth script does not provide the list of registered accounts. A workaround is to enable the extauth_cache option, see the ejabberd Guide. Regarding Shared Roster Groups, see the special member @online@. Submitted by smoqee on Wed, 2016-03-16 10:15. I've used jwt token for authetication from https://github.com/ParamountVentures/ejabberd-auth-jwt and it works great. Also I have enabled mod_shared_roster with @online@, just one group. So all online users should see presence from all. Behaviour is that the users which are already logged in are not notified that new users are logged in. After logoff/login you receive the currently online users. Also i added extauth_cache: 600, but I didn't see any difference. I am using 16.01 on mac. Submitted by prateekgera on Wed, 2016-09-14 12:23. Can you please help me to configure this properly. Submitted by Klaas Demter on Tue, 2013-12-17 11:40. Submitted by Vialanno on Mon, 2011-11-28 23:50. I've got just one question as to this entry: how can I make a roster shared list for LDAP authentication? Submitted by callmeGIR on Wed, 2011-08-17 00:38. Never mind, I have a problem with reading.. its brutal, so is my foot in mouth disease. Submitted by bmartin_3TIER on Sat, 2008-11-22 00:40. Is there a way to have add a "Conference" group with all the persistent chatrooms in it? just like all the user JID's. Submitted by mfoss on Mon, 2008-11-24 23:59. There isn't a way to indicate that a member is a chatroom. I tried this by entering 'chatroom@conference.host.domain.com' but that did not work. If I set this member in a Shared Roster Group, Tkabber detects that it is a chatroom and displays it accordingly. Yes, Tkabber (and other clients) implement XEP-0048: Bookmarks or an older version of that protocol, so a user can add bookmarks of chatrooms, which are usually displayed in the roster. But those bookmarks are not real elements of the roster, so mod_shared_roster can't benefit from that protocol. Submitted by sk on Fri, 2008-04-04 13:32. Is it possible make shared roster without authorization ? Submitted by sk on Mon, 2008-04-07 14:49.
all ok. Just to see accounts online need another client relogin or server restart. Submitted by kakuz on Sat, 2007-01-27 05:12.
is that possible shared all user into a roster with some exception ? Submitted by nordeep on Thu, 2005-10-27 08:24. I use svn version this @all@ feature a few weeks. And I use LDAP authentication, and I can say - All work perfectly!!! I add LDAP user, log in ejabberd and can see all jabber users, but if some one online, he must go offline, and then online back to see new user. Submitted by TheNerd on Wed, 2008-06-18 12:04. How do I make a roster shared list for LDAP authentication? Submitted by say on Tue, 2006-01-10 12:57. But if some one online, he must go offline, and then online back to see new user. I have no ldap, but problem is the same. Submitted by crustymonkey on Wed, 2006-10-18 14:45. I am seeing the exact same behavior in my server that I recently set up. Anyone ever find a fix for this? Submitted by mremond on Thu, 2006-10-19 07:23. I am glad to see that the previous fixes helped improving the "shared roster" feature.